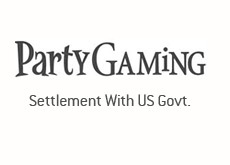 PartyGaming made headlines earlier today when they announced that they had settled with US authorities regarding "improper" transactions involved US citizens. The price tag for PartyGaming? $105 million, paid out in semiannual installments. The benefit to the company? They managed to secure a non-prosecution agreement with the United States, which will have significant long-term benefits to the company. The immediate benefit of this deal? Partygaming no longer has to worried about being prosecuted by the US government for their solicitation of US poker players prior to the enactment of the UIGEA. The short-term benefits? The company will find it much easier to raise capital without this cloud hanging over their heads. This will allow the company to make key acquisitions, which will allow PartyGaming to regain some of their lost market share. Imagine that the US government finally comes to their senses and decides to regulate and license online poker. Imagine that companies have to apply to the government for a license to operate within the United States. If you are the United States government, who would you grant a license to? The company that proactively negotiated a settlement with you, admitted wrong-doing and forked over a hundred million dollar plus payment? Or a company that thumbed their noses at you after the enactment of the UIGEA, and continued to accept American players? Bottom line - when it comes time to issue online poker licenses in the United States (and that time WILL come), companies such as Party Poker will receive them, and Pokerstars/Full Tilt Poker will be left out in the cold. Sure, Pokerstars and Full Tilt Poker could continue to operate in this scenario, but the competitive disadvantages would be HUGE. Companies operating under a license would be privy to a raft of advertising opportunities. A licensed company could advertise on Google, Yahoo and other search engines, while a non-licensed company could not. This is just one example for you. Also, I would imagine that the US government would warn of significant penalties for US citizens that are playing at unlicensed poker rooms. This would scare off many of the American customers at unlicensed rooms, and non-US customers would follow. In my opinion, this was an extremely savvy move by PartyGaming - a move that will pay very large dividends in the future.